Last week I was having one of those afternoon cravings for a snack, and I wasn’t exactly sure what I wanted, yet nothing I had on hand was really striking my fancy. Necessity is the mother of invention so I made these cookies. I wanted something sweet (duh) but I didn’t want to make a huge batch of anything. 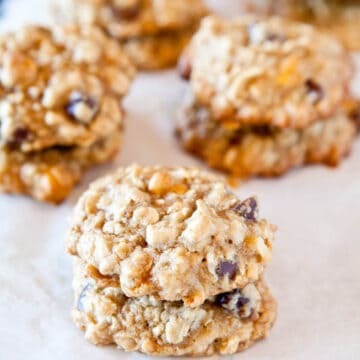 I try to make smaller batches of desserts whenever possible since variety is the spice of life, and this cookie recipe makes just one dozen smallish cookies. I also didn’t want to dirty too many dishes or haul out The Beast, and mixed the batter by hand. I wasn’t exactly sure what I had in mind but when I opened my baking cabinet and saw a partially-used bag of Heath Bar bits, I knew I would toss those in because I am a huge toffee fan. And I just happened to have a bag of coconut that was crying for some attention. The coconut flavor in the cookies is present but not overpowering, similar to the coconut in the Baked Orange Banana Coconut Donuts, which is present but doesn’t overtake the flavor palate. 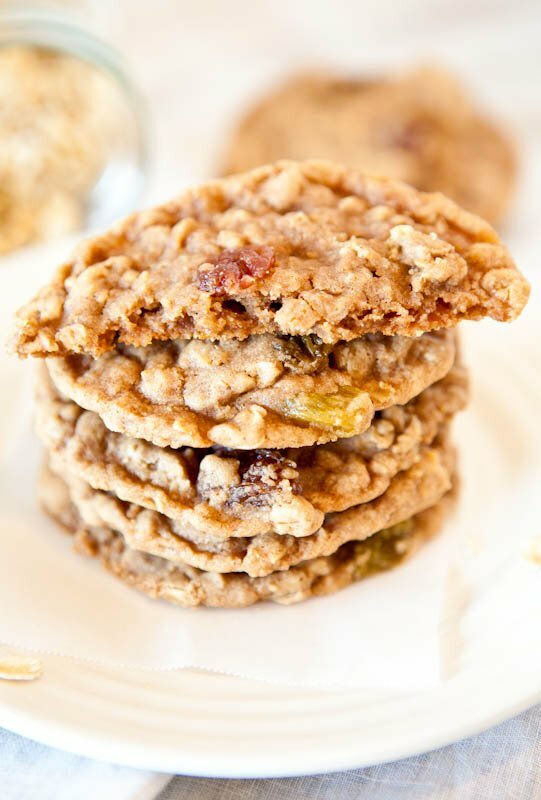 The cookies are just as oat-ey as they are coconutty, and the oats give them a nice heartiness and chewiness. 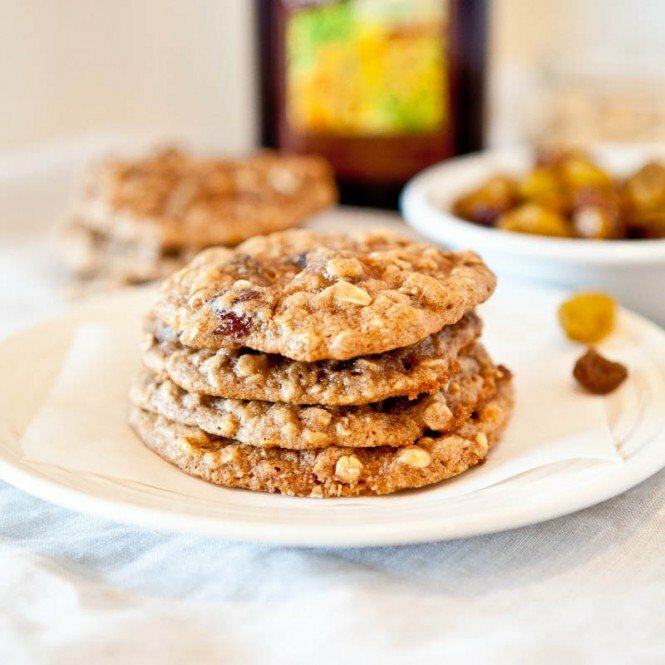 The toffee bits melted, the butterscotch chips and chocolate chips softened, the coconut toasted, the oats got chewy. These were a good little afternoon snack project. One benefit to these cookies is that they used up the odds and ends lining the shelves of my cupboards. From bags of butterscotch chips and Heath Bar Bits, to sprinkles and chocolate-covered dried strawberries, to coconut flakes and almond flour to green food coloring, I have so many odds and ends that take up valuable cupboard space. Looks are deceiving. 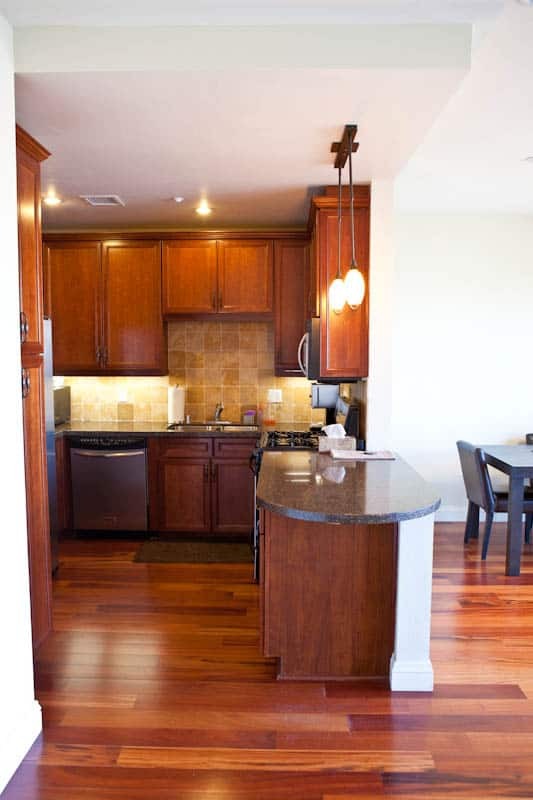 My kitchen is 3 feet wide by about 6 feet long and that’s if you count the countertop extension. Anytime I can make something that uses a half cup of this or a third of a cup of that and use things up, I am happy. 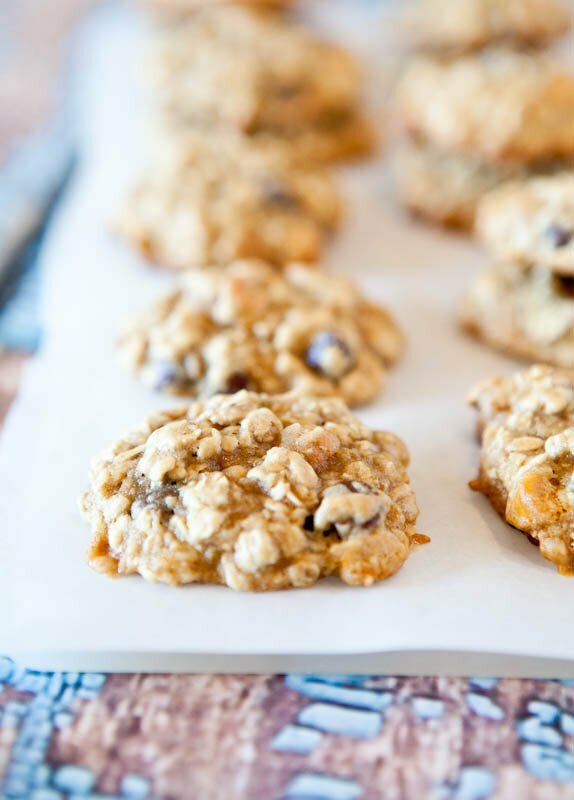 These soft and chewy cookies are loaded with texture and flavors. There’s Heath Bar Bits, chocolate chips, and butterscotch chips. While the recipe calls for many different baking chips, but all are optional. No need to buy a bag of chips just for 2 tablespoons. If you have a variety of baking chips on hand use them, but if not, don’t worry about it and use what you do have, or simply use all chocolate chips. Keep a close eye on them while baking because coconut is prone to burning in the last moments of baking. Preheat oven to 350F. In a medium-sized mixing bowl, combine the butter and sugars and stir (I did this by hand because this is a small batch of cookies, but use a mixer if you prefer). Crack one egg in a small bowl, beat it, and add half the egg to the butter and sugar mixture. Discard the other half or save for another use. Stir in the egg and beat the mixture until creamy. Add the vanilla, baking soda, coconut, flour, oats, and stir. Add the toffee bits and baking chips and fold to incorporate. Put the bowl in the freezer for 10-15 minutes and allow the dough to chill. 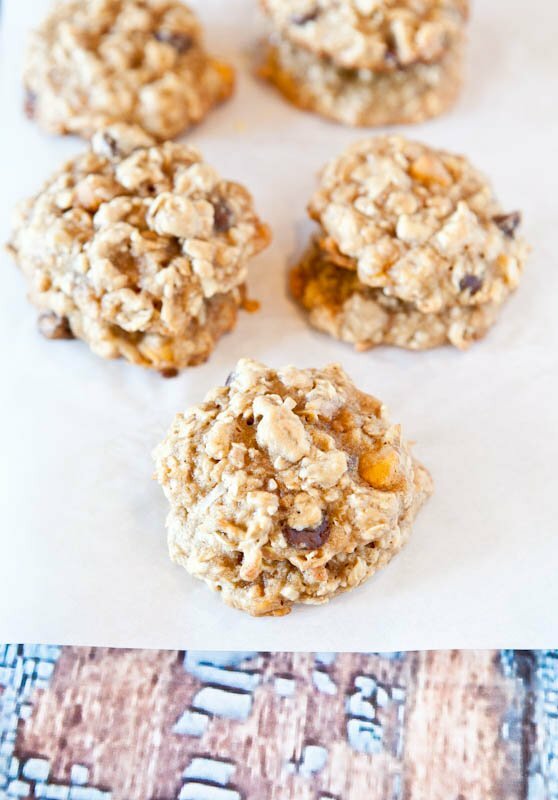 Remove the bowl from the freezer and scoop one-inch sized balls on cookie sheets, at least 2 inches apart. 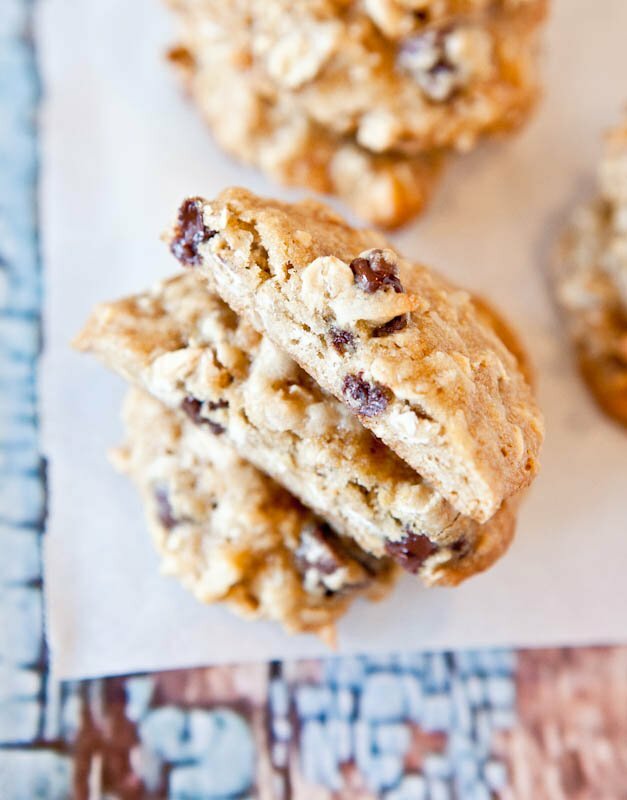 Bake cookies for 10 to 13 minutes, or until they are barely browned; watch them closely because coconut burns easily. The cookies will continue to firm up as they cool out of the oven. 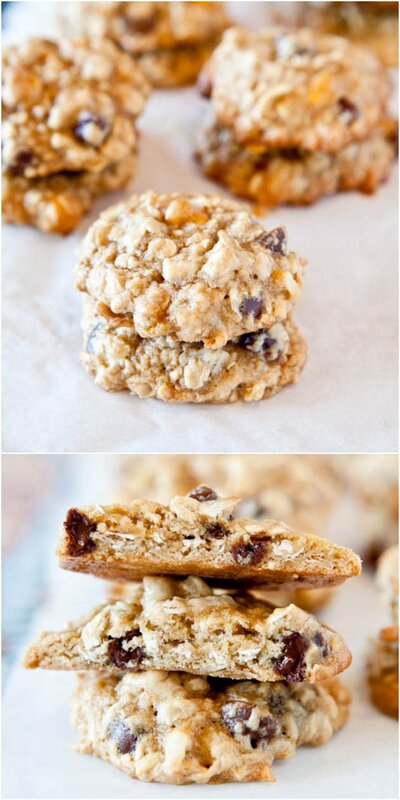 Allow cookies to cool on baking sheet for about 10 minutes. 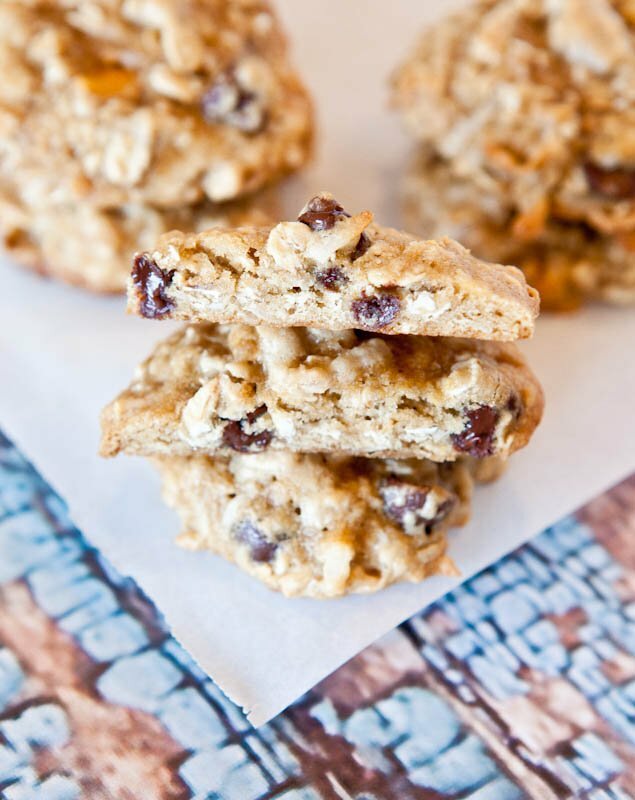 Cookies will keep airtight at room temp for up to 5 days or up to 4 months in the freezer. 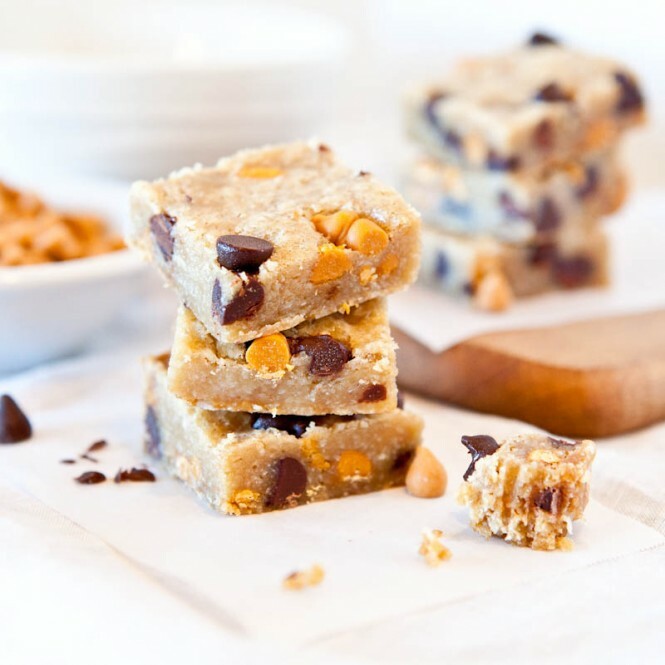 Or if you prefer oatmeal bars, try Chocolate Peanut Butter Oat Squares (No-Bake, Vegan, GF). Easy and fast to make and they wrap up really well for snacks and lunches. If you like coconut and like Girl Scout Samoas Cookies, try Samoas Bars (with Vegan & GF options). They’re very rich and dense. Yum. I love toffee. I’m not so much a fan of coconut, but if it’s baked in the right cookie, I’m ok with it. Oh yeah, these would definitely fill cravings! 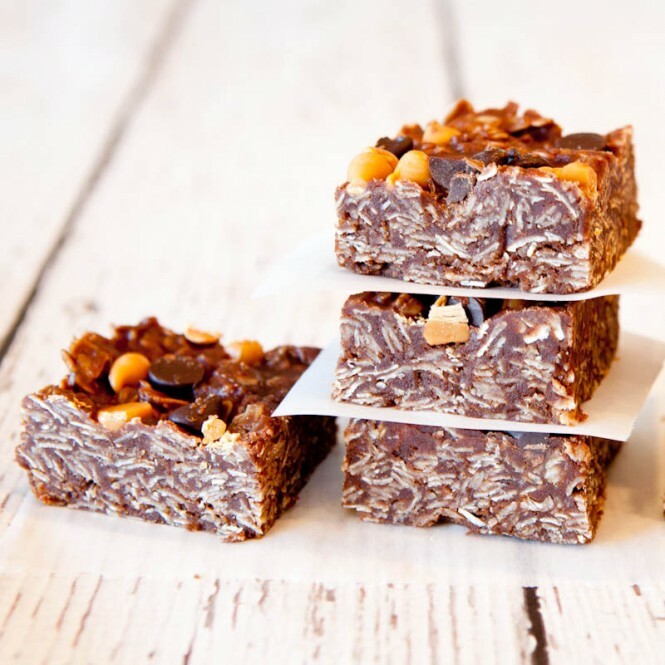 I love toffee, these look delicious! Ooh I am in love with all the different add ins you threw in there! They sound like the ultimate in treats! 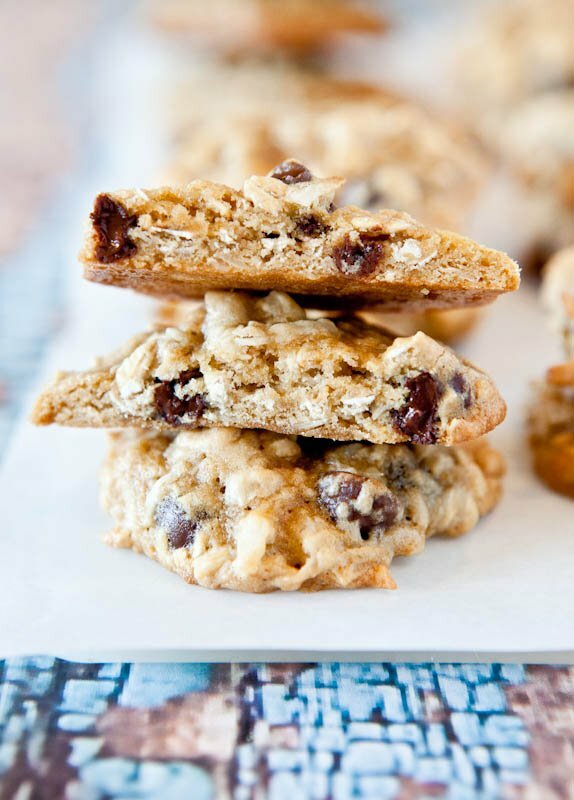 These cookies sound amazingly fabulous, awesome job creating them! It’s so much fun playing MacGyver in the kitchen with limited resources, that always seems to inspire creativity for me too. These cookies look frickin amazing!!! I love the mix of ingredients. You could just omit it and do all oats, too. OHmyGoodness!! 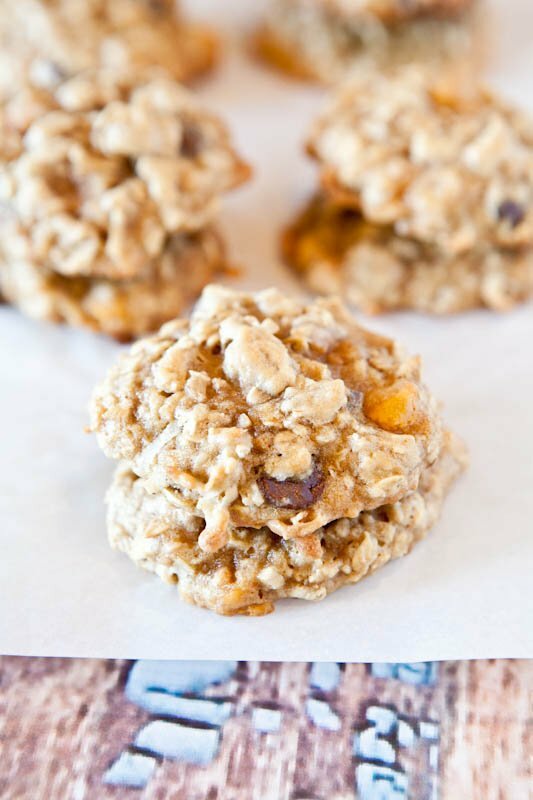 I’m still going crazy over anything & everything coconut, and love oats with a passion, so these cookies are pretty much a dream come true!! And very easy to veganize, too! Half an egg? Applesauce or even peanut butter or AB I bet! Awesome pic!!!! I can sniff mouth-watering tang from your pics! These look delicious – I could go for one right now! Made these cookies last night because of a MAJOR coconut toffee craving, and my Mom and I have practically eaten the whole batch already. 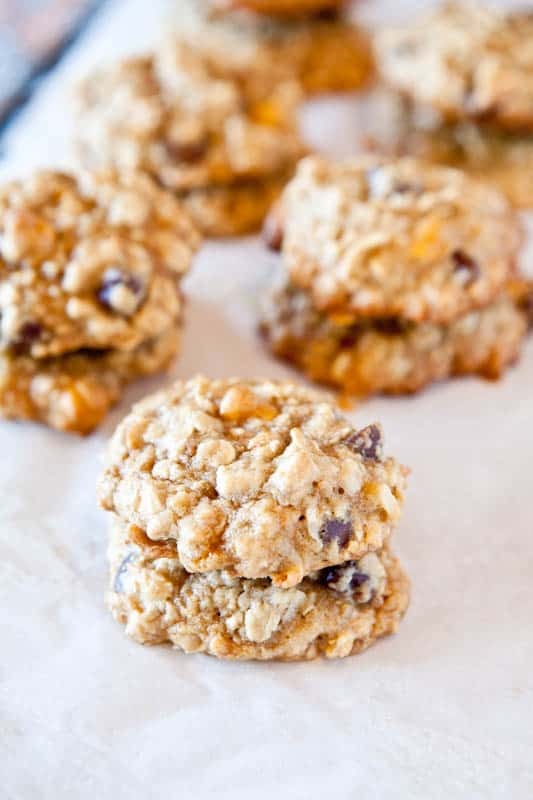 These are exactly as you described them- moist, chewy, and a little crispy on the edges. (We also used Heath Bar and it was the bomb. I’m glad they’re a hit, almost gone, & exactly as I described :) Thank you for trying them & LMK! I happened to stumble across this and had to try it! We have freezing rain at the moment so I had to tweak the recipe to use what I had on hand- omit the toffee and white chocolate and instead doubled up the dark chocolate chips and butterscotch chips. I also subbed coconut oil for the butter. Amazing! Definitely fit the bill and I plan to take some into work tomorrow so I don’t eat them all! Thanks for posting! Thanks for trying them and working with what you have in your pantry – wish more people improvised like that :) Glad you loved them & that they need to be re-homed, asap. I understand!